Offering you a complete choice of products which include metal dilator set. 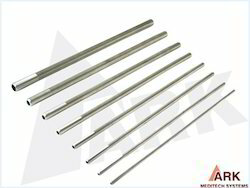 We are the leading manufacturer and supplier of Metal Dilator Set. Our sets have to their brand and form certain systems of highly sophisticated applications. We have come up with Metal Dilator Set, which is used by doctors across the globe. Dilator sets from the brand of advanced health care resources has to its name a promise of industrial perfection. Dilators range: 6 Fr. to 30 Fr. Looking for Metal Dilator Set ?